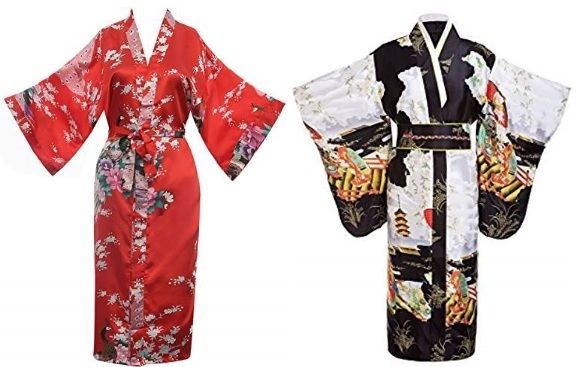 Are you actually looking for Women's Kimono Robes? Well, we hope you are because the reality is that you have found our Women's Kimono Robe page. Apparel Search is a leading guide to fashion, style, clothing, glam and all things relevant to apparel. 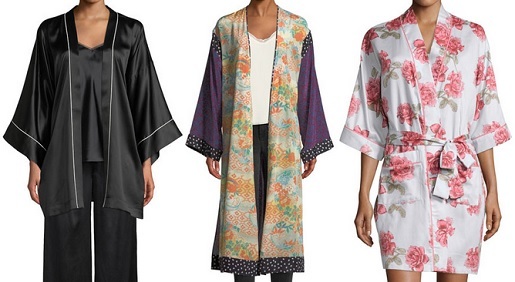 We hope that you find this Women's Kimono Robe page to be helpful. First of all, their is an absolute difference between a Japanese kimono and a kimono style bathrobe. A robe is a loose-fitting outer garment. A bathrobe, dressing gown, housecoat or morning gown is a robe, a loose-fitting outer garment, worn by either men or women. A dressing gown may be worn over nightwear or other clothing, or with nothing underneath. In addition to the traditional Japanese clothing, some bathrobes in the United States are made with some design elements similar to a Japanese kimono. The difference between kimono and bathrobe is that kimono is a traditional Japanese robe-like garment that is now generally worn only in formal occasions while bathrobe is a robe usually made of terrycloth or other materials that is intended to be worn when one is still damp from bathing or when there is no immediate need to fully dressed (such as lounging around the house). Kimono collar is referenced on some bathrobes in the USA. The kimono style robe actually has no collar per se. Kimono sleeve are wide loose short or wrist length. This style is obtained from traditional Japanese dresses and adapted as today fashion. It is the famous sleeve style and mostly loved by younger’s as it gives mush comfort because of its looseness. The term means "garment"; ki means "to wear", and mono means "thing" or "object". It has come to mean full-length formal robes. The standard English plural is kimonos, but kimono is also used for the plural form in English as Japanese does not distinguish plural nouns. Kimonos are often worn for important festivals and formal occasions as formal clothing. The kimono is a long, loose robe with wide sleeves and tied with a sash. Learn more about a women's kimono. If you want to be even more stylish, you should wear your Women's Kimono Robe.